SWOT Model steps and flow. The SWOT Model is a powerful tool used for strategic planning, evaluation, and analysis. SWOT stands for Strengths, Weaknesses, Opportunities and Threats. If you need to review, summarize, and / or create improvement plans conduct a SWOT. 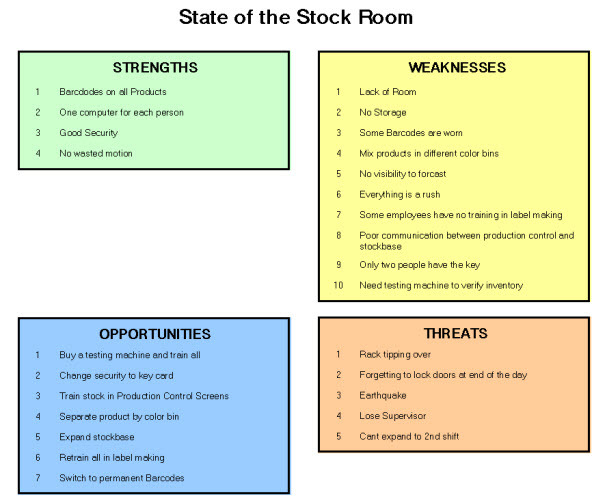 Use the SWOT model to manage brainstorming sessions. The SWOT tool jumpstarts idea generation, guides you through evaluating issues and generates possible goals. With current state SWOTs, you review a department, layout, system, program, machine, people, etc at its current state. Examine the current activities of the selected item. In essence, you review the good, bad, potential, and uncontrollable factors for that given item. You employ the SWOT model to find ideas for improvement. With a team brainstorming session, you quickly summarize the working and the non-working areas. Your team then reviews the SWOT and prioritizes the results. Another possibility, submit the SWOT results to senior management. Senior management then gets a real picture of the issues. Here are some propose SWOT examples. To figure out where the money goes, conduct a SWOT for the review of your business financials. 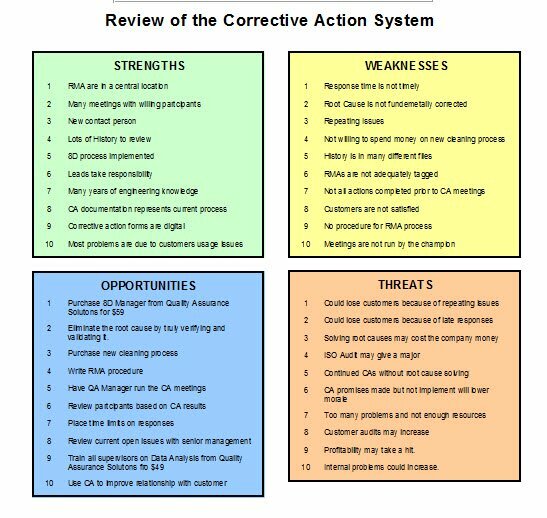 To speed the process of root cause determination, make a SWOT model for your corrective action system. To improve sales, create a SWOT for your current marketing approach. For a Kaizen event, generate a SWOT for the state of your given department. You can apply the SWOT model for your Quality Management Review. Here, you analyze the strengths, weaknesses, opportunities and threats of your Quality System. This type of SWOT provides you continuous improvement actions for your quality management system. Prior to making a change on a given item such as a new department layout, major system change, process change, moving people, starting a new program, etc, use the SWOT model to evaluate and predict the change results. Your team uses a SWOT to see the risks and benefits of the changes. In essence, you apply the SWOT to see the future. Here are some propose change SWOT examples. You company plans on creating a supplier quality department. Use the SWOT model to determine the possible costs of the new supplier quality department. You intend on implementing a major change to your plating process, create a SWOT to see the risks and benefits of this change. You want to convince senior management that you need to expand your facilities, present the SWOT chart on your expansion plans. You desire to push final inspection elements to earlier in the process flow. Create a SWOT chart to recognize the issues that may prevent this from occurring. This is a follow up SWOT. Complete this SWOT shortly after making the changes. This SWOT is similar to a current state SWOT. This quickly tells you unknown issues. For additional benefit, take this SWOT and compare it to the old propose change SWOT and / or the previous current state SWOT. This lets you capture the improvements. It also delivers a history of your company’s changes and shows you have methodically thought the changes through. Your team consists of experts regarding the subject material. Try to include as many people as possible. The team approach lets you generate new items from the feedback of other team members. The more brainstorming issues, the more valuable your SWOT model. Try to include customers of the subject matter. For example, if you are planning a new floor layout of a manufacturing department, include operators in that department. Also include stakeholders. These are people who are not directly involved in the issue but may have a vested interest. In the case of the new floor layout, include someone from the maintenance department. Have the team brainstorm the advantages of the SWOT model statement. List all the good items about the subject matter. Think about the items that are effective and efficient. List the valuable items. Pose these questions during the strength brainstorming. What are the best points about the subject material? What do you consider the strengths? What is valuable about the subject material? What items does the subject material provide that we cannot live without? What items do not need improvement? You are pleased with which items? The team brainstorms the weaknesses of the SWOT model statement. List all the items that need to be improved. List the roadblocks or items that prevent improvement. Consider faults, drawbacks, limitations, flaws with the given SWOT statement. It is important to be honest during the weakness brainstorming. Do not hold back any item. Pose these questions during the weakness brainstorming process. What items promote a hassle? What items stand in the way of progress? What do you dislike about the SWOT statement? What items are a waste of time? The team brainstorms the possible opportunities. Conduct this after the weakness brainstorm because the weakness items help you determine the opportunities. List possible improvement actions. Think of improvement actions within the SWOT model statement that will make the situation better. Pose these questions during the opportunities brainstorming process. What can we do to improve the SWOT statement? What would you hope to have changed? The team brainstorms threats that could cause a problem. Examine internal and external threats. Threats are items that have not happen but could happen. List items that you think threaten the SWOT statement. Include concerns, worries and fears. Brainstorming threats helps you understand possible uncontrollable conditions. What could damage the SWOT statement? How could something bad happen? After brainstorming each of the four SWOT items, it is time to create a SWOT Chart. Use SWOT Software to create the SWOT chart. Gather the items for each category. Eliminate the duplicates. You only need to list each item once. Presentation of the SWOT is key to getting notice and supporting plans from the SWOT. Many people spend hours on formatting the SWOT. If you use SWOT Manager, you don’t need to worry about formatting. Just type the items in and then print. Your SWOT chart is done in minutes. Review the SWOT and determine action items. Examine the strengths and see if any of these provide insight into other areas that are not part of the SWOT statement. These may provide direction for other SWOTs. You may generate new actions from this review. The weaknesses tell you the current state of affairs regarding the SWOT statement. After you determine and take improvement actions, future SWOT analysis should not include many of the weaknesses. Opportunities are your goals. Prioritize these goals. Create action plans to achieve these goals. Capture these action plans with Gantt Charts and to do lists. Assign responsibilities and due dates. Threats open your eyes. Examine the threats and take preventive actions prior to the threat occurring. Separate the threats between controllable and uncontrollable. Focus on preventing the controllable issues. Here is a SWOT example for Dell Computer.